Covering much of the Northern hemisphere, going no further south than Crete and no more North than southern Sweden, common Ivy and its variegations are a familiar sight to most. It is by nature dimorphic, meaning that it has the unique ability to grow in two physically distinct ways. 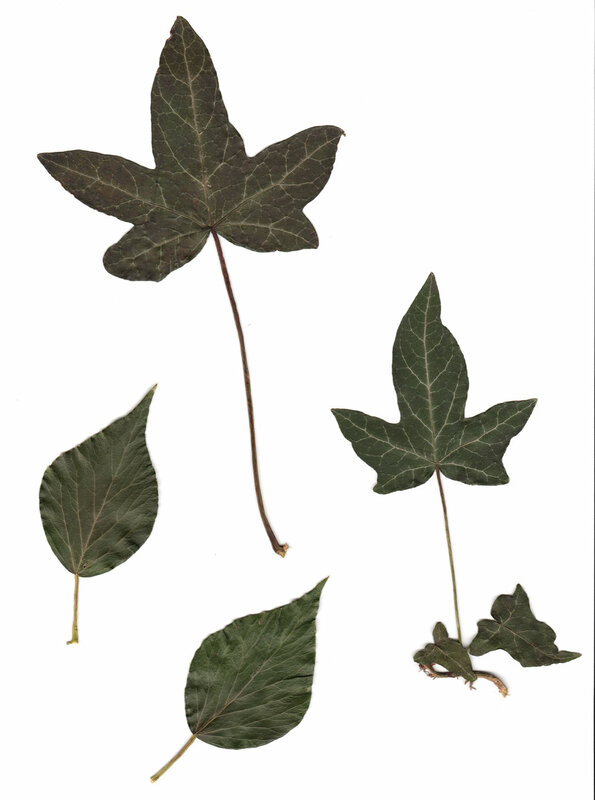 The ‘juvenile’ leaves are the familiar three-five lobed shape shields and the more mature, elliptically beefy shaped adult leaves. It was misguided to assume they are two separate species, as Theophrastus (314BC) and Pliny the Elder (23-79AD) both did - it wasn’t until the early 19th century that we woke up to the illusion. The adolescent leaflets are the creepers. Its adaptation thought to benefit its capacity to capture sunlight as it crept along forest floors and made its way up to more exposed territory. And the narrow un-lobed leaves are the climbers, better for once optimal photosynthesising environments are achieved, as well as fairing better against winds and the elements. And because no stage of life is clear-cut there are those leaves that lie somewhere in between the younger and older ones - slightly pronged. Locating and observing those leaves is endlessly fascinating. Ivy is much misunderstood. The archaic 18th century view that it is a parasite doing damage to buildings and sucking the life force from the trees, which so generously provide a climbing frame to the plant, is still sadly quite prevalent. Sites online such as the Woodland Trust try to dispel these myths, and even English Heritage have weighed in and said how its unique binding ability can actually help to preserve buildings as supposed to contribute to their demise. The small rootlets that you’ll find growing along the endless stems of ivy do not feed off the nutrients from the trees as once thought. It’s life force, like most living organisms, is generated from its roots in the ground; its heartbeat lives in the soil. The history, reverence and use of ivy throughout human history is a long one, in fact stretching back at least to 5,600BC. In the 1980’s excavation on a Stone Age site in Oakhanger, Hampshire has provided evidence that ivy pollen-grains made up to 87% of the total pollen-grain population found. It is possible that Ivy could have been used as animal feed in the most severe winters, thanks to its hardy perennial nature. However ritualistic uses of ivy have never fully faded and it is more likely than not that this also accounts for its prolific presence in archeological sites. Either way it is clear that ivy was a central part of our lives at one point. The first medically recorded use of Ivy is by that venerable ‘father’ of medicine, Hippocrates in around 460BC: evidence that ivy has been a component of the materia medica longer than it hasn’t. From antiquity through Middle Ages and right up until the early 20th century Ivy was valued for its seeming medicinal effects. The 17th century herbalist and astrologist Nicolas Culpepper (responsible for brining knowledge of plants and their uses to the masses), recommended leaves and berries boiled in wine were used to as vulnerary to help heal ulcers, skin blemishes and “green wounds”. It was a known emmenagogue, used to encourage mensturation, and was recommended with oil or water of roses rubbed on the temples to alleviate headaches. And as recently as 1937 medicinal uses of Ivy were still being written about, with one description detailing how “leaves and twigs… boiled in oil or hog’s lard” could be made into an effective pomade for sunburn. There is a comfort in knowing that the familiarity of ivy has, it seems, always been with us.